Intestinal gas, gastritis or bloating is quite common and nothing to be ashamed off. On an average, every person farts at least 10 times a day which is considered healthy. But experiencing it in an uncomfortable situation or in excess amounts can be embarrassing and discomforting. Trapped gas in the intestines can cause pain and discomfort. There are many reasons for the formation of excess gas in the stomach. Excessive drinking, improper chewing of food, eating spicy, stress, bacterial infection, poor digestion and food allergies are some of the reasons. Processed foods, oily foods, carbonated drinks, spicy foods and refined sugar foods can also result in excess gas and bloating. Flatulence, lack of appetite, abdominal pain, bloating, belching, a coating on the tongue and bad breath are some of the symptoms. There are many gas relievers and over the counter stuff to get relief from the problem. But do you really have to depend on them to solve this common problem? Fortunately, we have simple home remedies to tackle with this stomach gas situation. Ginger, apple cider vinegar or cinnamon – these commonly available ingredients can help. Today, let’s discuss regarding cinnamon – properties and how it can be used to treat gastritis. 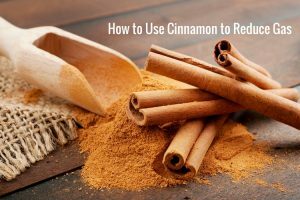 Is Cinnamon Helpful for Relieving Gas? Being a carminative, cinnamon breaks up the intestinal gas. Due to its prostaglandin-inhibiting action, it provides relief from the stomach pain caused by trapped and excessive gas. Cinnamon contains antifungal, antibacterial and anti-parasitic properties which help in healing any infections present in the stomach or intestines. Cinnamon reduces the secretion of gastric acid and pepsin from the stomach walls. How to Use Cinnamon for Gas? There are many remedies that use cinnamon for treating gas. We have listed them for your convenience. Choose one among them and try it regularly. This provides immediate relief from the pain and soothes the stomach to pass the gas freely. Add 1 teaspoon of cinnamon powder into it. Add 1 teaspoon honey and drink it. Repeat the process 2 times a day until you get relief. Alternatively, you can add 1 inch of a cinnamon stick instead of powder. This combination helps in soothing the stomach and promotes proper digestion. You have to repeat the process only whenever you require. Into a cup of warm milk, add 1/2 teaspoon each of cinnamon powder and honey. Repeat the process whenever you feel bloated. Alternatively, you can use whey or soy milk instead of milk. This combination can be taken before meals if you are a frequent sufferer of gastritis or flatulence. Combine 2 teaspoons of honey and a pinch of cinnamon. Combine equal portions of green cardamom seeds, fennel seeds, and cinnamon. Dry fry them in a pan for 30 seconds. Blend them and store in an airtight container. Eat 1/2 teaspoon before each meal. Repeat the process until you find relief from gas and bloating. Combine 1 tablespoon of honey and few drops of cinnamon oil. Mix the ingredients well and take it throughout the day. Cinnamon supplements can also be taken to get relief from gas. See the label or consult a doctor for proper dosage as per your medical conditions. Cinnamon supplements can interact with antibiotics and other medications to consult a doctor before taking them. Cinnamon can induce labor so it is better to avoid during pregnancy. Lactating mother should not use more than 1 teaspoon of cinnamon per day. People with diabetes should be careful with cinnamon consumption as it can lower blood sugar levels in the body. Very high doses or more than 6 teaspoons of cinnamon can be toxic. Children should be given very less quantity of cinnamon. Avoid drinking water between the meals. Exercise regularly or do some physical activity. Have you tried cinnamon for gas? Did you get relief from gas using cinnamon? Feel free to share your experience, tips and queries in the comments section below. Can drinking a combination of lemon, ginger,cinnamon,and honey cause bloating? How can you ovoid drinking water between meals. Isn’t that the only time you can drink water?